Over the years I’ve tried many different methods to organize my home. However, my most successful attempt to cleanliness involves a custom-made check list. You know me… I love my checklists (and I love any excuse to make one)! 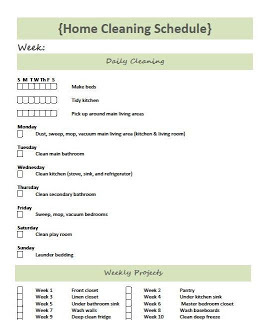 As you may have noticed, weekly projects are included in this cleaning schedule. I find that donating, throwing out, or recycling at least five items a week keeps the clutter minimal. Also, if you laminate the checklist and use a dry-erase marker, this form can be reused every week. I want you to have a free downloadable copy of my cleaning schedule. All you have to do is click the download button at the end of this post. I invite you to share in the comments, what methods do you use to keep a clean house? Then share this article with your friends! 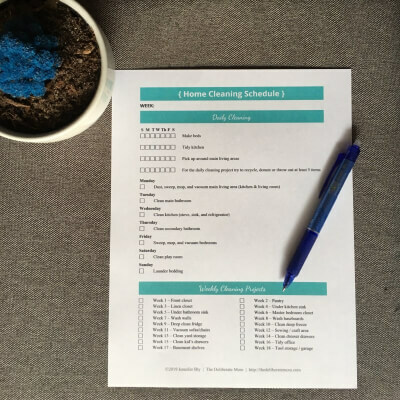 A printable home cleaning schedule and checklist to help keep you organized and your home clean! Download your cleaning schedule today! I love your list….thank you so much! I don’t make lists for cleaning anymore. I will say that since it is just hubby and I the house stays very clean. We also do most of the cleaning on the weekend. I love checklists and a clean house too! Thanks for the printable! Great checklist. Thanks so much! I make lists of all kinds and then promptly forget all about them!! I definitely like the idea of getting rid of 5 items every week (recycle, donate etc)–that would definitely make my apartment less cluttered.